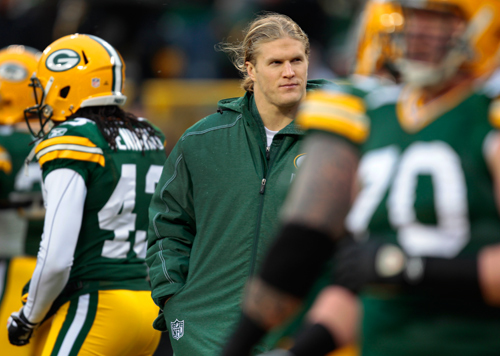 Packers LB Clay Matthews will be one of many players in street clothes when the Packers play the Bears on Monday Night Football in a few weeks. I know the Packers play the Vikings this week and we shouldn’t be looking ahead to the Nov. 4 Monday Night Football game against the Bears, but I can’t help myself. The number of talented players that might be watching that game from the sideline or on TV because of injuries is staggering. Suddenly, the Black and Blue division has turned into the Broken Bones and Torn Ligaments division. Let’s assume all of those players don’t play. Now let’s add up their 2012 numbers and combine them with each player’s 2013 statistics. This is what would be sitting on the sidelines during a marquee Monday Night divisional game. And the NFL wants to add more regular season games, expand the playoffs, and possibly play a doubleheader on Thursday night. This entry was posted in Adam Czech and tagged Bears, Bears Injuries, Jay Cutler, Jermichael Finley, Lance Briggs, Monday Night Football, Packers, Packers Injuries. Bookmark the permalink. Consider the fortune of the packers in this light; the number of teams with significant injuries, and how it has made huge impact on their prospects; Patriots, Giants, Jets, Bengals, Falcons, Rams, Bears, Texans, Browns, Ravens, Bills, Lions. All are downgraded. Not all were contenders…but their injuries to key players have pretty much knocked them out of contention or down to bedrock. GB is making consistent string of wins despite those injuries. So, fine to lament, but let’s consider this thing of resiliency. Though Cutler has his knocks, imagine the pale of stupor hanging over Chicago football now. Oh, not to mention how Vikings must be hanging up their bras by now after that…uh…game of I-don’t-know-what they played in New York on Monday. Wasn’t lamenting. That’s just a lot of talent (possibly) sitting on the sidelines! Well…lamenting is very justified. I am certainly lamenting with all of the key talent on the sideline. But wow, a lot of teams really have plummeted into some dis-array like I don’t ever remembering. I just thought the Vikings were going to turn in a better year than that. I agree with comment below. Its surprising how some bad teams can really create some problems for GB…so I wouldn’t write off Vikings one bit. Adrian Peterson gets 28 yards and Josh Freeman hits 40% of his passes. I can’t remember watching the Vikings be this bad. No, they are terrible. The looks and grimaces on Leslie Frazier’s face during the game said it all. What worries me is that they will decide to go back to Ponder for the Packer game. He played well last time they played. I don’t believe that Freeman can be ready to play the Packers D, which has been on a nice roll lately, and have really been solid against the run. Freeman needs a lot more time and even then he may not be the man. Even with the improved run defense, Peterson still scares me. Vikings Twitter feed just stated that Frazier will stick with Freeman at QB this week against GB. Knowing the success he had against GB last year and the transitionary state at QB, Peterson should be getting the rock a lot–at least in the early going–on Sunday. Till there behind by 3 TD’s at halftime… That should pretty much take him out of the game to some extent. I don’t remember very many games against the Vikings that were easy victories. While they are in a bit of disarray, we are beat up. Going into their den has never been easy and we would be foolish to look past this game. I have greater respect for AP than anything the Bears throw at us. Let’s keep our eye on the ball. November 21, 2010 – Packers DOMINATE the Vikings in every sense of the word, @ the Dome, 31-3, holding Adrian Peterson to 72 yards on 14 carries. November 14, 2011 – Packers DOMINATE the Vikings, in every sense of the word, holding Adrian Peterson to 51 yards on 14 carries. Those two easy victories stick out in my mind. Relax, we will do fine. This is why general managers and coaches get rings too. Having viable second string players ready to play at high level in not a matter of chance. The mid-level NFL teams that have a few key players are devastated when a star player goes down. Poor drafting and coaches not developing young players cause these teams to fail. The Packers have not had this problem and annually field a deep, deep team. TT and MM might be not be your favorites, but they are mine! The alternative thought would be that the Packers play systems (offensively and defensively) that are very forgiving, and that a broad range of ability levels still allow them to function. Do I believe that? Not for a second. But it’s a possibility. How many players have left the Packers in recent years and played BETTER after they moved on? Not many…if any. I’d wager that most didn’t even play up to the level they played at in GB. Maybe that’s scheme, maybe it’s letting guys go at the right time, but maybe it’s just good assessment of talent. To some degree that’s a possibility on Offense due to Rodgers greatness. Remember how Favre always made WR a lot better than they really were. That’s not the case on Defense tho. Remember folks when we play the Vikings, Adrian has 250-300 yards. This is not a sure thing. I do believe we will kick there azzes as long as MM doesn’t go into prevent mode before the game even starts. The last time AP faced the Packers w/ Jolly in the lineup he had 25 for 55 yds and 25 for 97, and that was w/ Favre at QB and a viable passing attack. Watch for something similar again this year! You cannot discount how much Jolly has meant to the Packers run D.
Hell even without Jolly in ’10 we held him to 51 on 14, and in ’11 we held him to 72 on 14. If Dom Capers just hits Freeman a few times early, we will be fine. It’s when he goes into his zone shell that we always get burned, like in JAN @SF. The equipment keeps getting “safer” and yet the injuries seem worse and more frequent. Finely is listed as 6’4 and 240 lbs. while Alan Page, the defensive MVP and a defensive tackle in the 70s was listed at 6’4 and 245 lbs. Are we just evolving to get so much bigger or are PEDs involved? It is starting to seem that the human body is out growing the game of football. I am starting to wonder if they played without all of the padding if it would actually be safer. Perhaps the padding is giving players an unrealistic sense of safety and the equipment is actually being used as a weapon. If you didn’t have a “safe” helmet, would you bang your head into someone else’ head? Media hacks shilling for the players drives me crazy. The debate shouldn’t be about highly paid athletes playing two more games. The debate should be about fans being made to pay full price for four meaningless preseason games. Historically, when the pack has a number of injuries, it is the culture to persevere. The Bears fold. Minnesota is the tougher game, and I hope we are ready for Sunday night as it will be a tough one. I saw most of the Chicago-Wash. game, and I must say it looked to me like McNown gave them a better chance to win. He consistently moved the ball down the field, showed awareness and put less balls up for grabs. Cutler may be more talented, but he’s also good for 3 or 4 good pick opportunities a game. We might not be getting the break we think we are here. I definitely would not look past Minnesota. They’ve stunk this year, but they almost look at this as their SB. I don’t know if too many fan-bases hate(envy) another as much as Queens fan do us. The Packers are missing a lot of firepower and the Queens will be at home, on national TV and fired up. This will be their players most emotional game of the season(wouldn’t be surprised if GJ gave a pregame speech). I won’t say this would make their season, but it would give Ragnar something to toot about. I don’t see Nick Perry on your list. Is he coming back soon with a broken bone in his foot? That would be huge if he does, The Pack will win both games if he can play. Mojo, I agree with you that McNown look decent sunday. Im hoping it was just a change in quarterback that washington was not prepared for and had game plan for cutler. Or, that washington’s defense is just that bad which it probably is. If the Packers sustain no more injuries before the bear game, and if Nick Perry and James Jones can return, I like our chances at home. Interesting choice of stats… Just out of curiosity, why would we “add up their 2012 numbers and combine them with each player’s 2013 statistics”? It just seems like a really strange, arbitrary stat to add up a full season plus six or seven additional games. Not a big deal, I guess. Just showing the talent that will (possibly) be out for the game. Instead of just saying, “Hey, these really good players might be out,” I whipped out my calculator and added up some stats to show what the game would be missing. Hello, I believe your web site may be having internet browser compatibility issues. When I take a look at your blog in Safari, it looks fine but when opening in IE, it has some overlapping issues. I merely wanted to provide you with a quick heads up! Aside from that, excellent website!